Hi everyone, I'm back from a fabulous time in southern California with some wonderful friends -- we all had a blast and it was so much fun meeting a bunch of great ladies! Many congratulations and thanks to Jami, Joy & Emily for putting on a wonderful weekend!! As promised, since we crossed that 50,000 visit mark on my blog, I'd like to thank you with a wonderful gift. I don't have everything ready yet, but I promise, it will be worth it! I have a stamping deadline due this Friday that I will be working on all week, so here's what you need to do this week . 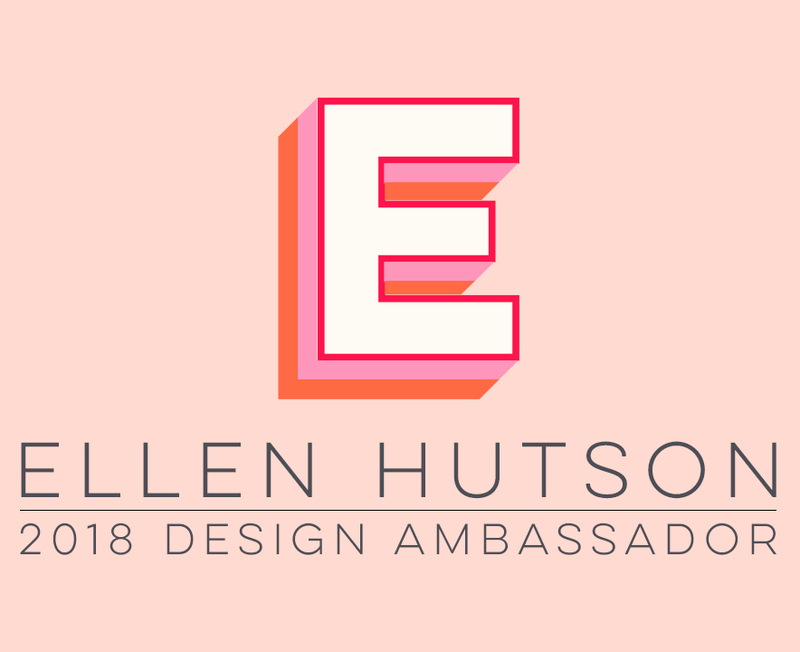 . . if you'd like to enter the drawing for the giveaway, please post a question below that you'd like me to answer by Friday at 6pm CST -- that's it! It can be a stamping-related question or personal. Then I'll gradually answer these questions over the coming weeks. I'll let a random number generator pick the luck winners on Saturday and then I'll be so excited to get back to FUN stamping next week! Have a great week, everyone! Here's a door prize I did for my California stamping weekend trip. This was one of those Target $1 spot black wood frames (for a 4"x6" photo). 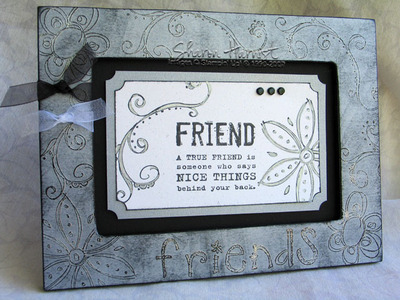 I cut the brushed silver metallic cardstock to fit the front of the frame and then stamped all the doodles and "friends" (from Doodle Alphabet) in Versamark ink and then heat embossed it with silver embossing powder. The silver cardstock is then adhered to the frame using Stampin' Up's Anywhere Glue Stick. Next, I used a Jet Black StazOn ink pad directly on the paper and doodles to highlight them. This gives a distressed patina look to the bright, shiny silver cardstock. The Friend insert is where your photo would normally go. It is stamped with black StazOn ink and then just like the frame a few posts below, I used the AquaPainter (a water reservoir watercolor brush) filled with Future Floor Wax to paint silver Pearl Ex onto the large flower and doodle. The floor wax seals the Pearl Ex and makes it into a paint, to adhere to your cardstock. The corners are clipped with Stampin' Up's Ticket Corner punch. Black brads finish off this piece, then it is matted with the same brushed silver metallic cardstock as I used on the frame. Black and white narrow organdy ribbon finishes off the frame. All supplies except frame from Stampin' Up! Ahhhhh, here's that yummy Au Chocolat designer paper from Stampin' Up! again (my favorite). But this time it's not just chocolate and vanilla, there's a little celery thrown in! The large flowers in the background are originally vanilla but I colored them with a celery marker,simple as that! The designer paper is distressed, then matted with celery cardstock and mounted to a chocolate card base. The doodle from Doodle This (SU Spring mini catalog) was stamped with basic brown on vanilla cardstock and also colored with a celery marker. The edges of the vanilla piece were sponged with the brown ink and then faux stitched with a chocolate marker. Celery ribbon is threaded thru a Horizontal Slot punch and the piece mounted to the rest of the card using dimensionals. Enjoy your weekend, I'm off to sunny (I hope!) California! I've been tagged a few times while I've been gone today, which means I'm supposed to tell you 7 things about myself. I'll do that AB (after bedtime)! Back soon . . .
Ok, here goes . . . I was tagged by Amy, Julie and Jennifer -- thanks, gals! 1. I'm a native Texan -- born here and have lived within a 2-1/2 hour drive of my birthplace all my life. I know in some states, you'd end up in a different state if you drove that far, but not Texas! And I'm afraid I have the southern accent to prove it! 2. I have two girls -- the loves of my life (along with hubby!) -- they are exactly 2 yrs and 9 months apart. Neither were full-term and both were born by emergency inductions. The youngest has straight hair and the oldest, very curly. When she was a toddler, people constantly asked if I permed her hair! Yeah, right -- like I would even be able to get a 2-yr old to sit still long enough to perm her hair, much less -- who would ever do that?!! The things people say! 3. My favorite candy is anything chocolate with peanut butter or nuts. 5. I was on the tennis team in junior high school and on the honor roll (highest scores). 6. I've only been stamping for 3 years and thoroughly LOVING it! 7. Wine is my first adult drink of choice . . . I'm not too picky -- chardonnay or merlot. Followed closely by martinis! I'm supposed to tag 7 more people to share about themselves, if they choose, so I'll try tagging some people that I don't think have been tagged yet: Lori, Trudee, Lindsey, Lisa, Valerie, Meg and Jody. I'll be scarce the next few days, as I prepare to leave for a fun girls stamping (and shopping and gabbing) weekend getaway to visit some fantastic friends in sunny southern California! I'll try to set up a couple of posts for you over the weekend while I'm gone, so check back in. It looks like we'll mark 50,000 hits here on the blog shortly, so I'll be sure to have some goodies for you when I return next week! This 9" x 7" frame incorporates a few different things that you all mentioned you would like for me to highlight here on the blog: Altered items and Pearl Ex. It was also inspired by last Thursday's Ways to Use It weekly challenge over on SplitcoastStampers, which was metal. For the metal challenge, I used Stampin' Up's metal Hodgpodge Hardware kit in Aged Copper. At first, I didn't care for this very dark set of metal until I tried sanding it with a buffing block, which removes some of the aged color and lets the beautiful copper show through! I did that on the nameplate/brads on this frame and also the brads in the center of the Prima flowers. Also, you'll see some "metal" accents on the Primas -- I used Future Floor wax in an AquaPainter, dipped in Super Bronze Pearl Ex (this matched the copper metal best) and painted the metal accents onto the flowers! And for those of you who were worried about leaving the floor wax in your AquaPainter for extended lengths of time and it ruining your brush . . . worry not! Mine has been filled for at least a year, stored brush-end up and is still just as pliable as it was new! All I did was blot the tip with tissue to remove any excess wax before storing it. I also used the floor wax/Pearl Ex to paint the doodle and flower inside the frame. The images were first stamped with StazOn onto Naturals Ivory cardstock. The Family insert (4" x 6") and large flower are matted with brushed copper metallic cardstock. Tip: Since I've about used up all my copper Hodgepodge brads, for the ones on the "Family" insert, I used SU's copper brads from the Vintage brad set (which are a very bright copper) and aged them a bit by tapping them onto the Timber Brown StazOn ink pad and letting them dry -- it doesn't take long. The accent strip of paper down the left side of the frame was faux zig-zag stitched onto Naturals Ivory cardstock and then adhered to the frame with SU's Anywhere Glue Stick (as was the paper over the rest of the frame). I "painted" the edges of the frame with a chocolate chip craft ink pad directly to the frame -- works like a charm and then the sides of your frame perfectly match the paper! Stamps: Doodle This, That's Nice. Ink: StazOn Timber Brown, Craft Chocolate Chip, Chocolate Chip Stampin' Write Marker. 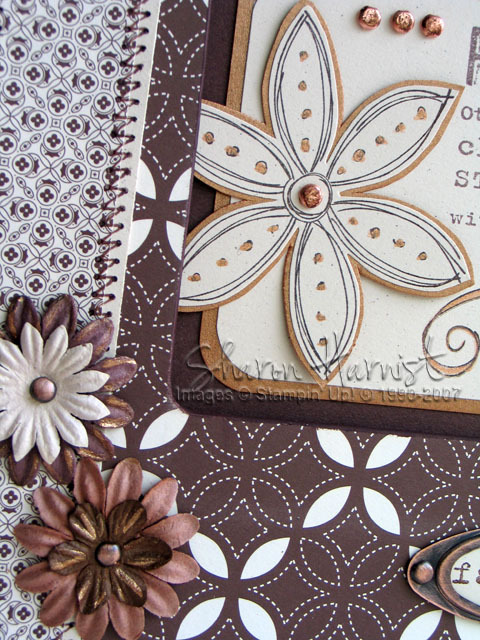 Cardstock: Naturals Ivory, Chocolate, Brushed Copper Metallic, Au Chocolat Double-Sided DS Paper. Accessories: Copper Hodgepodge, Crafter's Tool Kit (Paper Piercing Pad, Template & Tool), Twill, Copper Metallic Cord, Anywhere Glue Stick, Super Bronze Pearl Ex, AquaPainter, Corner Rounder & Sm Oval Punches, Glue Dots. Prima Flowers, Unfinished frame from Michael's. Edited to add: I've had a few emails asking why I use the floor wax to paint with the Pearl Ex. Sorry I didn't explain this better -- When using Pearl Ex, you must have some type of binder to make it "stick" to your paper and/or seal it so it won't rub off. Using the wet floor wax with the Pearl Ex acts as a binder and sealer all in one! This makes it easy to paint with and you don't have to seal it. Give it a try -- it makes a beautiful sparkly paint! Do you want free stamps?!! 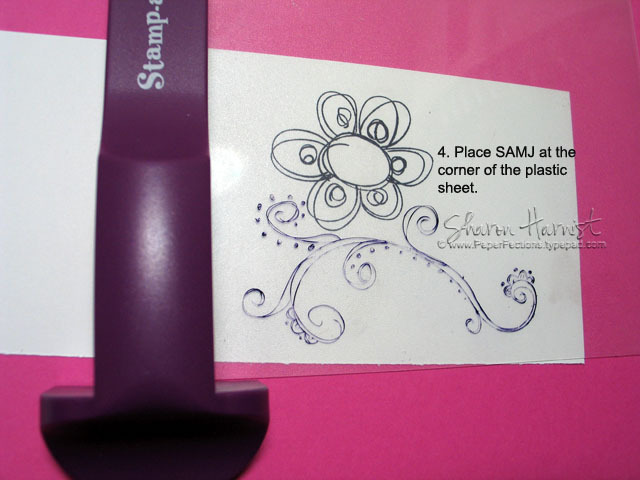 Check out my friend, Cami's great blog (link below) for all the details about being on a research panel for Stampin' Up! They'll send you a box of goodies about every 3 months and all you have to do is answer a short online survey about every week or two! Click here for the details on Cami's blog. Unfortunately (for me!) it's only for customers, not demonstrators. Good luck and let me know if you get chosen! My goodness, yesterday was a very busy day . . . I was "tagged" by some awesome bloggers: Trudee Sauer, Leslie Miller, Colleen Schaan, Kimberly Van Diepen, Judith Novak and Lisa Silver. Check out their highlighted names to see their posts on their blogs. What this means is that they named five of their favorite blogs to visit and I was one of them (thanks again, ladies)! So check out the others they tagged/listed and I'm sure you'll find some wonderful new blogs to visit, just as I did. Sorry for the cop-out but I hope you understand! 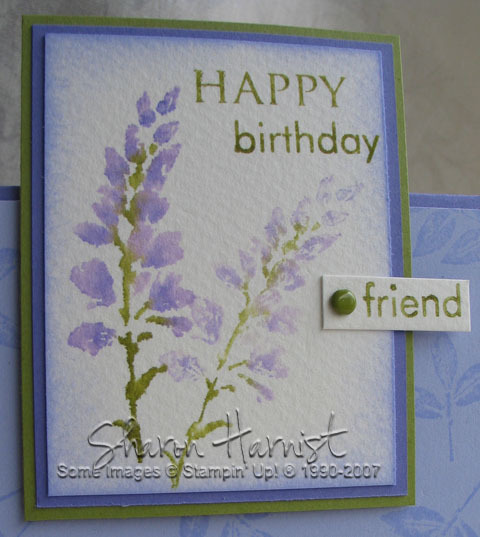 Happy stamping and have a wonderful weekend! 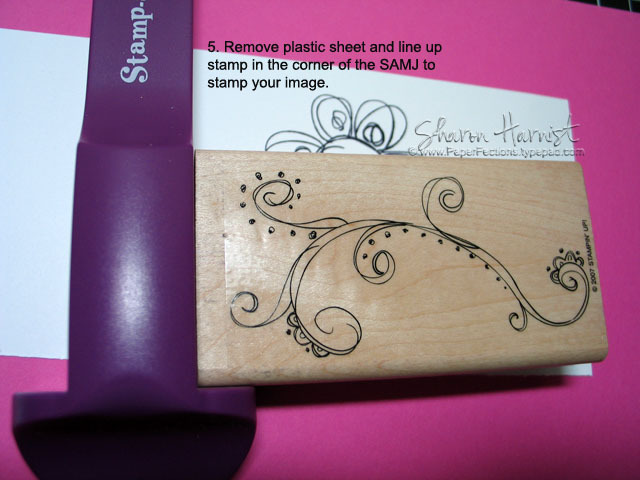 I believe the original instructions that come with your SAMJ may show placing the tool with the T shape at the top but it's easier for me to align my stamp with it at the bottom. 1. Line plastic sheet up in the corner of the SAMJ. 2. 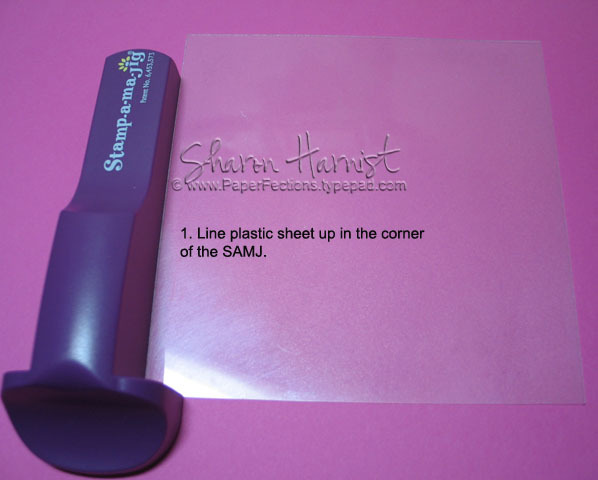 Stamp your image onto the plastic sheet, lining it up in the corner of the SAMJ. 3. 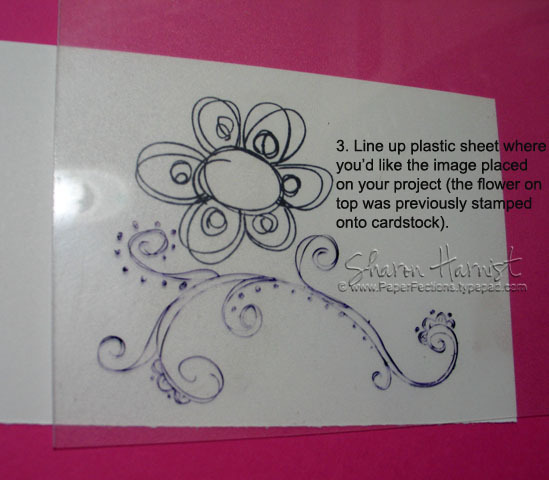 Line up plastic sheet where you’d like the image placed on your project (the flower on top was previously stamped onto cardstock). 4. Place SAMJ at the corner of the plastic sheet. 5. 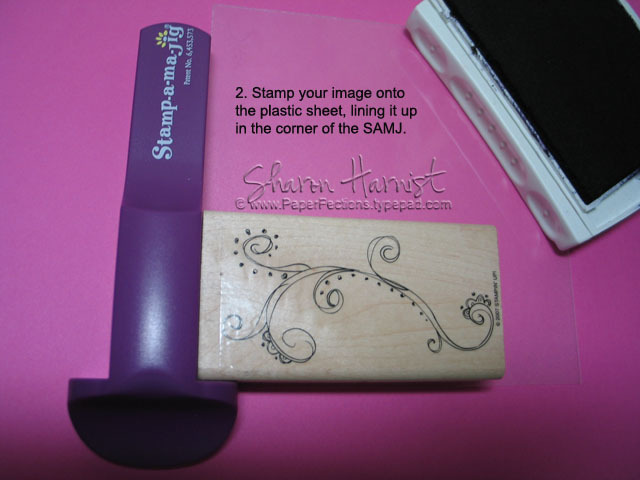 Remove plastic sheet and line up stamp in the corner of the SAMJ to stamp your image. 6. A perfectly aligned image! Have fun playing with this wonderful tool! I love a pop of bright colors against black! 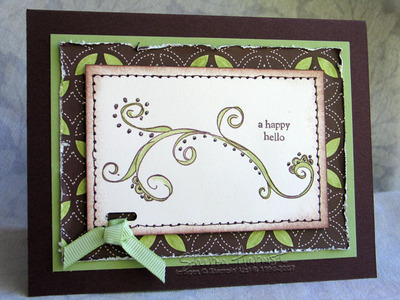 This doodle hello was created by stamping the Doodle Alphabet letters by Stampin' Up! along the swirly doodle from Doodle This using the Stamp-A-Ma-Jig. I'll post a tutorial later today (maybe tomorrow) on how to use this handy tool. After stamping with StazOn Jet Black onto shimmer white cardstock, I colored the images with Stampin' Write dye-based markers. This image was matted with caribbean cardstock and pixie pink that I cut with scalloped edge scissors. A row of black brads finishes off this piece. 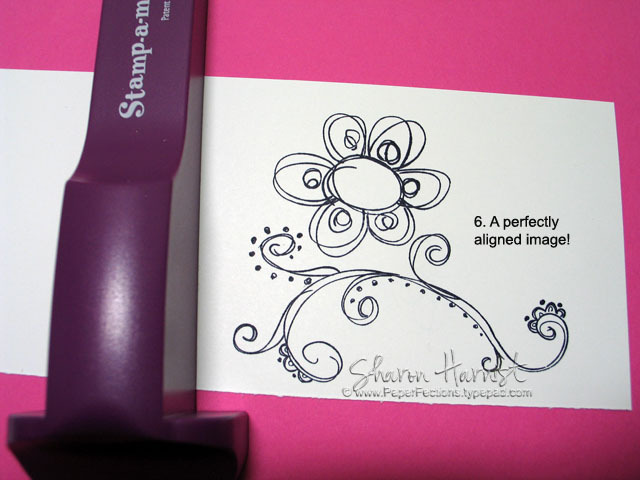 The little flower is from the Doodle That set by Stampin' Up (available in the current spring mini catalog until June 30th). A happy hello to all of you today -- happy hump day! Can you believe the week is almost over? All products by Stampin' Up! Unfortunately, I needed a sympathy card today for an online friend whose niece was one of the college student victims at Virginia Tech yesterday. My heart goes out to her, her family and the families of all who lost dear ones in this tragic event. 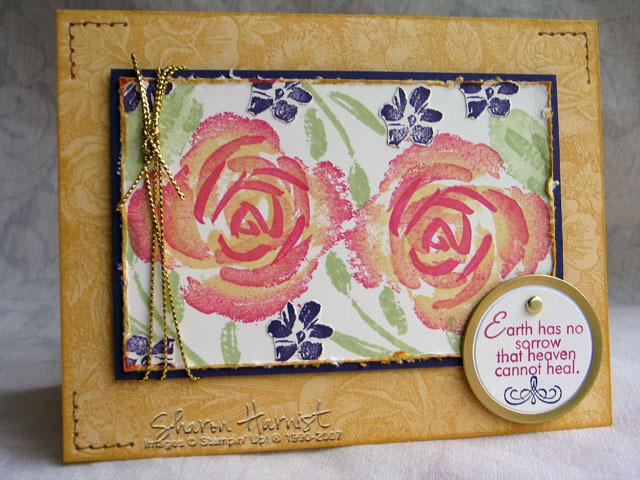 I happened to already have this Roses in Winter panel by Stampin' Up! stamped in these colors for a previous project (and still laying out on my stamp table) when I headed over to SplitcoastStampers this morning to check on my friend, Emily's, color challenge for the day. Wouldn't you know it, we're both lovers of Roses in Winter AND these pretty colors because she chose Rose Red, So Saffron & Elegant Eggplant as one of her favorite color combos to highlight for her birthday celebration (happy birthday, Emily)! 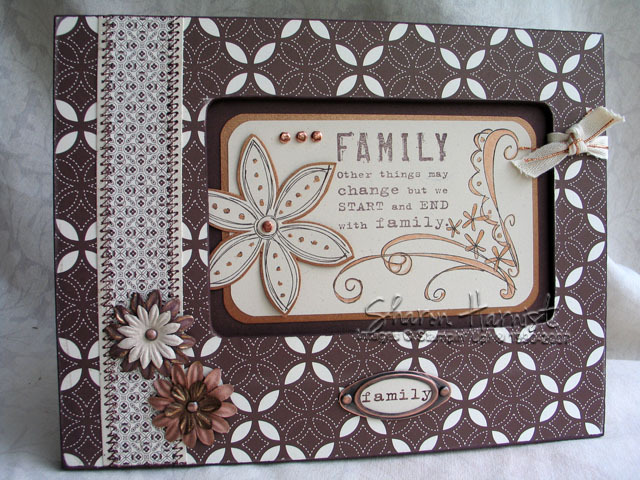 (All supplies by Stampin' Up! 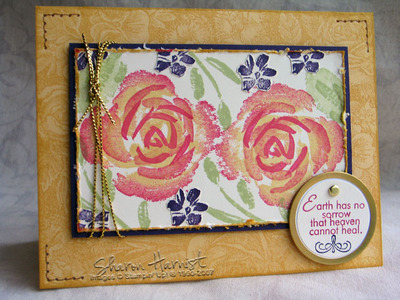 ): The Floral background was stamped with saffron classic ink onto saffron cardstock and three corners faux stitched with close to cocoa Stampin' Write Marker and the paper piercing tool & mat from the Crafter's Tool Kit. I stamped the roses from Roses in Winter by first inking them with saffron classic dye ink and then rolling the edges of the stamp on the rose red ink pad. This will give you a two-toned image and the technique is called Rock 'N Roll. The first and second layers of the rose were stamped this way and the final, smallest rose piece/center was stamped in straight rose red ink. The tiny flowers were stamped with eggplant and stems/leaves stamped with celery . . . all on vanilla cardstock. The edges of the floral panel were distressed with SU's distressing tool from the cutter kit and matted with eggplant cardstock. The panel was wrapped with gold metallic cord and mounted with dimensionals to the saffron card base. Parts of the sentiment from Close as a Memory were selectively markered and stamped repeatedly, using the Stamp-A-Ma-Jig to get it to fit into the 1-1/4" circle shape, punched and adhered to the brass metal edged tag. The tiny flourish is from Fancy Flexible Phrases and it was stamped with eggplant ink. I don't know what else to say except to offer my condolences to any of you who were also touched by yesterday's tragedy. I got a nice surprise this afternoon when I opened an email from Nichole Heady, letting me know that she chose my Butterfly Kisses card entry as honorable mention from PaperTrey Ink's monthly contest they have (congratulations to the winners)! Check out her blog entry and scroll down about half way. Along the way, you may recognize a few other stamper's entries as well! On the 15th of each month, PaperTrey debuts a new stamp set, so keep a watch for the next one on May 15 AND watch for a countdown/preview on Nichole's blog that she usually has about 5 days before that. She includes some great tutorials along with sneak peeks of the upcoming new set! This month, they also added a whole line of 30 Palette Hybrid ink pads which are a highly versatile new ink (which I've had a bit of difficulty finding). Thanks again for the mention, Nichole! I'm lovin' these clear acrylic stamps that ultra-talented designer/stamper Nichole Heady has created. This butterfly is from PaperTrey Ink's second release, Butterfly Kisses. Even though this butterfly is very intricate, I found it pretty easy to selectively ink parts of it, to achieve a two-tone beauty. The upper portion was inked with VersaMagic Dew Drop chalk ink in Pixie Dust and the lower portion with Key Lime. This was my first use of these inks and I like them already! 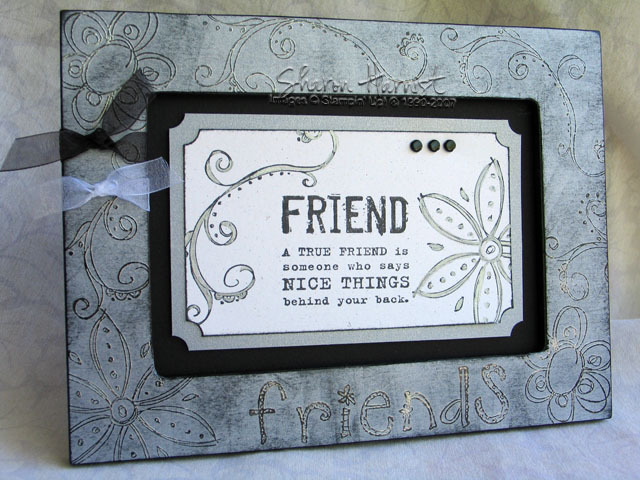 The butterfly and sentiment were stamped on shimmer white cardstock by Stampin' Up, cut out and matted with a Marvy Giga Scalloped Square punched piece that was edged in Sahara Sand VersaMagic Dew Drop chalk ink. The butterfly is popped up with dimensionals. I thought these patterns of the Gypsy patterned paper by BasicGrey mimicked the swirls in the butterfly pretty well. The scalloped strip was cut with SU's Slit Punch and holes punched in the scallops. This piece was also inked with the Sahara Sand chalk ink. A piece of light pink narrow organdy ribbon finishes off this springy card! Thought I'd share one of my favorite photos from Easter weekend. 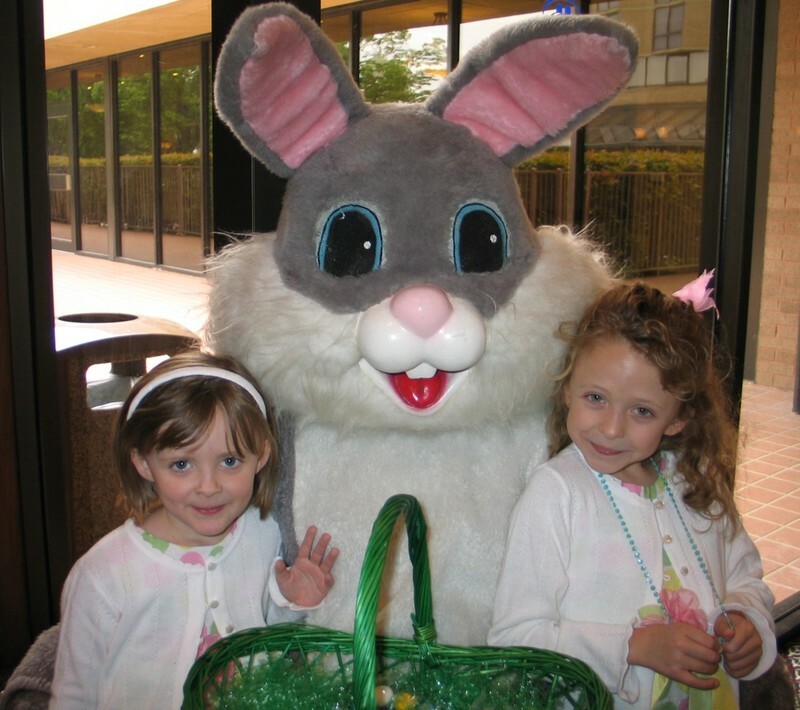 After church, we headed to brunch with family and they had an Easter bunny there, handing out candy to the children. Thank goodness, because we hadn't made it to the mall for photos yet! I love that they still believe, although my oldest (almost 7-1/2) said that some other kids at school were telling her the EB wasn't real. Quite wisely, she said "But if you don't believe in him, he won't come, right Mommy?" :) I'm also grateful that they understand the real meaning of Easter. And we had to bundle up that morning, as it was quite chilly . . . remnants of the snow we got the day before! I can't remember it ever being that cold OR getting snow this late in Texas! I hope to return with some more April flower cards for you soon, but I must get started on another secret stamping deadline. So my apologies if the blog is a little bare for a little while. BUT I'm definitely planning on a special blog giveaway soon, as we're nearing 50,000 hits!! Again, many thanks to you all for visiting! The focal image was sponged around the edges with amethyst dye/classic ink and matted with lilac & olive cardstock, then mounted with dimensionals to the 4.25" square card base stamped with leaves from this set in amethyst ink. 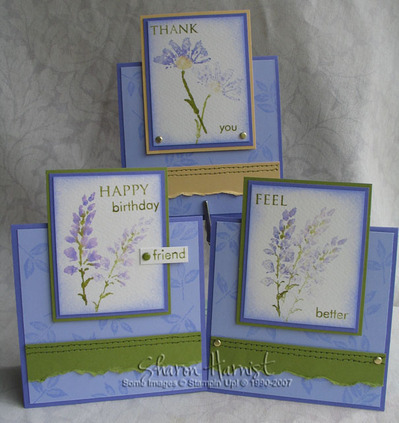 Sentiments were added to the focal images using PaperTrey Ink's first stamp set, Paper Tray. I love the versatility of the separate, clear acrylic word stamps that you can arrange however you'd like! Finally, a torn strip of cardstock is added toward the bottom of the card, with a double row of faux stitching. All supplies by Stampin' Up! unless otherwise noted. Run on over to my fellow X-Dirty Girl (and friend! )'s new blog More is More. Jami is giving away some fun stuff and check out her blog while you're there -- she does amazing work! I hope to be back by the end of today or first thing tomorrow with some new flower cards for you . . . I guess that's my theme for the month!